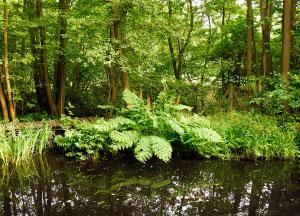 So-called "flowering" ferns made familiar by our native Royal Fern (O. regalis), which is found in many bogs and marshy woods, and is well worth cultivating, as it is the largest and most striking of our native ferns, sometimes attaining a height of 8 feet. It should be planted in moist peaty soil, and the most suitable spots are half-shady places on the banks of streams or of pieces of water. When exposed to the full sun it does well, with its roots in a constantly moist, porous, moss-covered soil, if sheltered from strong winds. In shady positions and in deep bog soil it attains a great size. A gross feeder, revelling in richly manured soils. The various N. American Osmundas may be associated with it. O. cinnamomea is an elegant N. American Fern with pale green fronds; the variety angustata is smaller, and the fronds are less inclined to droop. This species, like O. regalis, is deciduous. O. Claytoniana is another deciduous species, and has vivid green fronds, 2 to 3 feet high. O. interrupta is the same. O. gracilis is a native of Canada, somewhat resembling a dwarf form of our Royal Fern, the fronds about 2 feet high. O. spectabilis is a slender form of O. regalis; its fronds are smaller, and the young ones come up reddish-purple. These exotic species are of the simplest culture in the hardy fernery, in moist peaty soil. N. America.